Enjoy the benefits of switching to an all-natural cleaning system with the best green cleaning products! You don’t need a lot of green cleaning products to clean your entire home! I recently received a message on Instagram asking to link a few products in my DIY liquid hand soap recipe. I thought it would be nice for me to link not only those products, but also my favorite green cleaning product for everyday cleaning. In the liquid hand soap recipe, I share how I dilute castile soap to make everyday hand soap for my family. This has become something I continue to do after discovering the amazing benefits of castile soap. I now use castile soap for nearly everything in my home, and when castile soap isn’t quite powerful enough, I turn to Sal’s Suds (castile soap’s big brother). If you’d like to make your own household green cleaning products, I have some free printable labels for you to use! When writing this post, I wanted to include links to many green cleaning products, like The Honest Company, Mrs. Meyer’s, etc… But the truth is, you don’t need all of those. With the four products I have listed here. You can clean your entire home without purchasing anything expensive. In fact, Thieves is really optional, because it is so much like Dr. Bronners. If I kept only two green cleaning products in my home, it would be Castile Soap and Sal’s Suds, along with vinegar and baking soda. This is my favorite cleaning product of all time. When I run out, I scramble trying to figure out what to do! I use this to clean my clothes (in my washing machine), on my hands, face, hair, pets. I use this as my dish soap and countertop spray. You can use this to clean fruits & veggies, floors, and so much more! Do not use in your dishwasher. Castile soap is concentrated, and has different dilution rates for different uses. For a full list of dilution rates just visit Dr. Bronner’s website. This is my #1 recommended green cleaning product. Sal’s Suds is a brother to Castile Soap and is not a soap. It is a concentrated hard-surface all-purpose cleaner. This cleaner has a bit more gusto than traditional Castile Soap when it comes to cleaning things, so use this for deep cleaning, getting rid of tough messes, or for laundry. Sal’s Suds rinses a bit better in hard water situations and seems to have a little more de-greasing power. Sal’s Suds can pretty much be used to clean anything in your home except for humans. It is more drying that Castile Soap, so for things like hands, hair, face, pets, etc… use Castile Soap instead. Thieves cleaning solution is made from Thieves proprietary essential oil blend. The cleaning solution is ultra concentrated just like Castile Soap and Sal’s Suds and can be used for many things. The plant based formula is recommended for degreasing, glass cleaning, and everyday cleaning around the house (including bathrooms). Citrasolv is a really neat green cleaning product made from orange peels. In fact, you can even make your own green cleaning product with orange peels! The solvent is a powerful degreaser that will remove things like grease, tar, lipstick, adhesives, wax, permanent marker, etc… I first discovered this product during a craft project, but quickly fell in love with how well it cleans things! This is a great green cleaning product to keep in your cleaning caddy for tough and unpredictable stains. I love that it is all-natural, yet incredibly powerful! Baking Soda - Baking soda can be used to deodorize, degrease, and clean nearly everything in your home! Mix baking soda with a little Castile Soap to make a really wonderful soft scrub! Vinegar - Vinegar is a great cleaning agent that can be used to get rid of build-up and soap scum. Use it to clean everyday items like blinds, floors, microwaves, and much more! Can vinegar and baking soda be mixed to clean? Don’t mix vinegar and baking soda together. It’s not dangerous, but the result of the chemical reaction is a diluted sodium acetate solution that won’t have any cleaning power to it. Hydrogen Peroxide - Hydrogen peroxide can be used to disinfect and clean your home. Use it to clean grout, or disinfect surfaces (like wood cutting boards). Salt - Coarse Salt is a great green cleaning product that can be used to clean pots and pans or scrub down sinks! I love using wood handled scrubbing brushes with tightly packed bristles perfect or scrubbing veggies, pots & pans, or dirty hands! I love the way linen softens and strengthens over time. The flax based textile is my favorite, I prefer it over cotton, although it takes a few washes before it softens up nicely, it won’t leave a fuzzy residue the way cotton often does. Instead of using paper towels, I find that I like to use linen wash cloths for wiping down counters, drying dishes, and drying hands. This helps keep our paper towel use down. I find that we don’t use paper towels more than necessary by keeping a pile of linen wash cloths handy for everyone! If you plan on making your own green cleaning products, glasswork bottles and jars are imperative. I use tall glass bottles with stoppers for batches of diluted Castile Soap. For bathrooms and the kitchen, I like using glass soap dispensers that have a screw off lid. Whenever the dispenser is empty, I simply add water and top it with more soap. Learn how to make your own liquid hand soap. Did you know sponges have a large impact on the environment? They’re also known to harbor lots of nasty bacteria. You can sterilize your sponges by placing them in boiling water for a few minutes, microwaving them, or popping them in the dishwasher. 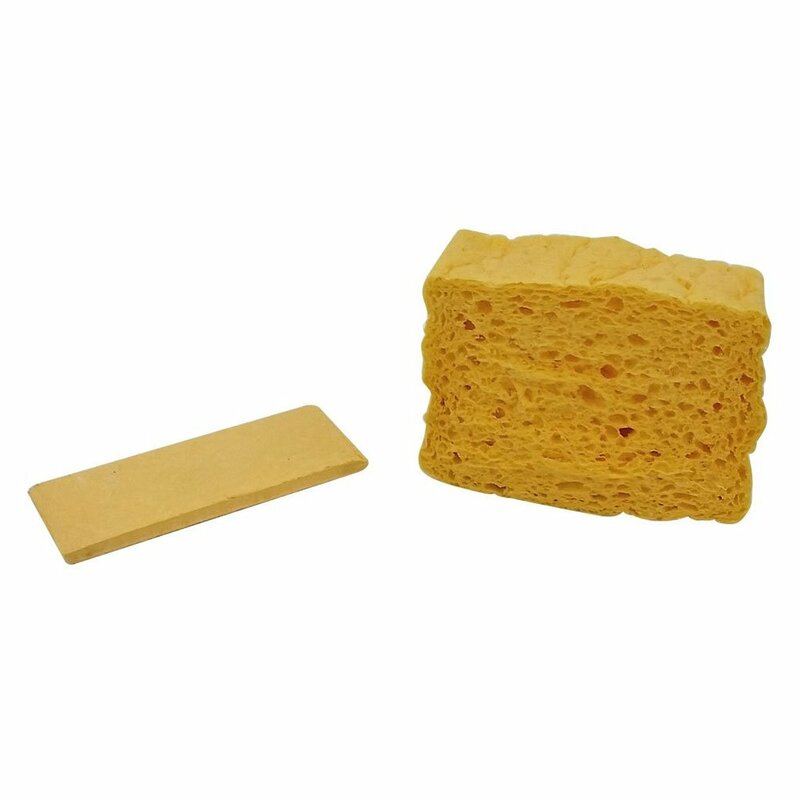 I recently found these 100% cellulose pop-up sponges from France, available on Amazon. They are absolutely wonderful! I wish I would have found them sooner! What are some of your favorite green cleaning products?